A Piece of History and the Start of a Legacy. What do you do when you are ordered to make a propaganda film for the Japanese Navy during World War II? This was the task of Mitsuyo Seo (Momotarô’s Sea Eagles) who two years earlier had made a short film for the Navy. He went and made Japan’s first ever full length anime film to get the young Japanese population to join the glorious all conquering Navy in the South Pacific Ocean. The film takes the form of three raw recruits that have just finished their basic training and have returned back to their rural village before deployment. 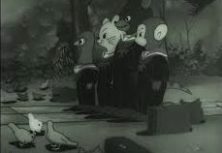 A bear cub, a monkey, a pheasant, and a puppy are all members of the Navy, but they are not all sailors as the Navy also covers planes and parachuter’s and those that build airfields for the planes, this is because the Pacific Ocean is so big and it has thousands of islands dotted within it. 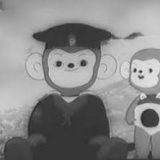 Mitsuyo shows that all the disciplines work together within the Navy as when they are celebrating the monkey’s younger brother falls into a river while chasing the monkey’s cap and is carried towards a waterfall, they all work together to save the little guy. The film jumps forward in time to when the group have all been promoted and it is time to take over an island and the paras drop in and get the locals to help them as the forests are cleared and hangers are built. The film shows the locals as inferior people and that they are in awe of the Japanese discipline and technology. They toil in the harsh sun and the torrential rain to get the invaders jobs done. The mighty Japanese army trains for the invasion of other islands occupied by the farcical British Army. 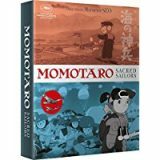 Momotaro: Sacred Sailors is a landmark animation. And comes with the bonus of the anime short The Spider and the Tulip.